Training for my second marathon has been both very different AND very much the same as last time. The differences are pretty, well, different. In 2011, what got me out of bed in the morning to run my miles was Abject Fear. I spent most of my training cycle terrified of the distance. How was I going to run 26.2 miles? That seemed really, REALLY long. Terrifyingly long. I wasn’t sure I could do it – even the morning of the race I questioned my ability. And then I did it. And it wasn’t easy, and it hurt me, but I ran the distance. And now? Well, that distance isn’t terrifying. I know it’s going to be hard. But I also know I can do it. Two years ago, after a long run, I felt a HELL of a lot more beat up than I do now. That part was the worst part of marathon training for me. I’d finish a long run completely depleted. The last couple of miles I’d walk more than I ran. There were some runs where I just couldn’t get the mileage I needed – had nothing in the tank. Like a couple weekends ago. I ran 18 miles. And when I finished, I felt GOOD. Starving, mind you (more about THAT in a minute!). But once I ate, I felt kind of normal. No more tired than usual, no more sore than usual. The difference, I think, is related to two big things: Mileage consistency and better fueling. I have spent most of the year running 30 miles a week – a consistent mileage base. I also have two more years of running experience. Running is cumulative – the more you do it the better you get at it. And I have FINALLY found a fueling strategy that really works for me – 3 or 4 sport jellybeans every half hour. This allows a consistent energy source without being too much sugar in my stomach (which gives me digestive issues). And hydration, too – I have discovered that the 32 ounces I carry just isn’t enough. I need to refill every bottle at least once during the run so that I am not too dehydrated at the end. I am feeling SO good about where I am, fitness-wise, this time around. It’s SO nice in a place where I get out of bed for a run because I want to, not because I’m terrified that if I don’t get my miles in I’ll post a DNF*. There are a lot similarities about this training cycle and my last marathon training which I want to document. In part so I can look at this when I’m done with the race and remember, REALLY, how it is. Because it’s not easy, either – especially at this point in my training. First of all, I have spent the last month running on Dead Legs. That’s what I call it – tiredness, fatigue, whatever. Dead Leg runs are the ones where you don’t really love the run, physically, and you’re too focused on turning your legs over to get into any sort of emotional zone. I had two speedwork sessions where I barely got through the workout – one where I was in tears after the second repeat, then another I cut short. I am finally starting to come out of it; this week in particular I’ve had fewer Dead Leg runs, thank goodness. But I still don’t feel like I’m RESTED, not really. It’s the nature of the beast. Running distance is, at some level, teaching your body to deal with fatigue and cope with discomfort. It teaches your body to run more efficiently, to recover whenever it can – and it teaches your mind to get through the last 10k of a marathon, when you are tired and sore and still have at least another 45 minutes of running in front of you. And I keep this in mind with every Dead Leg run; the more practice I have running on tired legs, the better prepared I’ll be on race day. But man. I miss my old legs – the ones that had spark in them. I’ve logged so many Dead Leg runs that I’m getting tired of repeating the same old story: Good practice today running on tired legs. This will serve me well on marathon day. I miss running fast, feeling light and energetic. I miss it a LOT. The good news, from what I hear, is that a good taper strategy will get me back to my light and energetic legs – hopefully exactly the day I need it – October 20. There’s a voice in my brain – a real Neanderthal – who keeps screaming: FOOOOOOOOOOD. FOOD! FOOD! FOOOOOOOOOD! I have spent the better part of the past year keeping diligent track of my food intake; have gotten to a weight which is more or less maintainable for me. I have a repertoire of snacks and dinners where I don’t have to THINK so much about what I eat; I just eat my regular food and it’s fine. Except, now, it’s not fine. I’m HUNGRY. I need bigger portions, more carbs, more protein. I need to eat. Also the same: I’m tired. Like bone-weary tired. Dog tired. By the end of the day, inertia traps me and I want to go to bed, but it means getting up and walking upstairs and brushing my teeth, and it’s just SO nice to lay here on the couch and just rest. My brain thinks: MOVE, Karen! But my body replies HELL NO. Part of it is that work is busy too, and I’m sneaking runs in here and there. This week, I ran 3 (incredibly stressful while I imagined Owen drowning and no one noticing) miles on the treadmill during Owen’s swim lesson, and my alarm rang at 4:30 this morning so I could fit in an 8 mile run before I went to my client in Boston. But mostly it’s because running is, well, a lot of work, physically. (Which, you know, DUH, of course, right? It shouldn’t be a surprise that I’m tired a lot.) But it’s something worth mentioning. Because this isn’t my usual brand of tired. All in all, though, I am feeling pretty good about my training and where I am right now. I feel like I will be as prepared as I can be in 5 weeks. Which is really all I can ask for. *For my non-runner readers, a DNF is “Did Not Finish.” It’s where you start a race and then bag it in the middle or the end or whatever. I’ve come close to doing this – as recently as a year ago, when I sprained my ankle at the start of a half marathon with one of my best friends – but have yet to DNF. And I prefer to keep it that way. Owen was born via c-section; he was breech. And if I’m being truthful, I was happy with the idea of a c-section; after years of infertility I was terrified that my body would screw up in childbirth, and the idea of a procedure where doctors could have him out of me within minutes gave me a lot of relief. I didn’t really expect to HAVE a baby, you see. I had convinced myself that something was going to happen to him while I was pregnant and we were going to end up empty-handed. 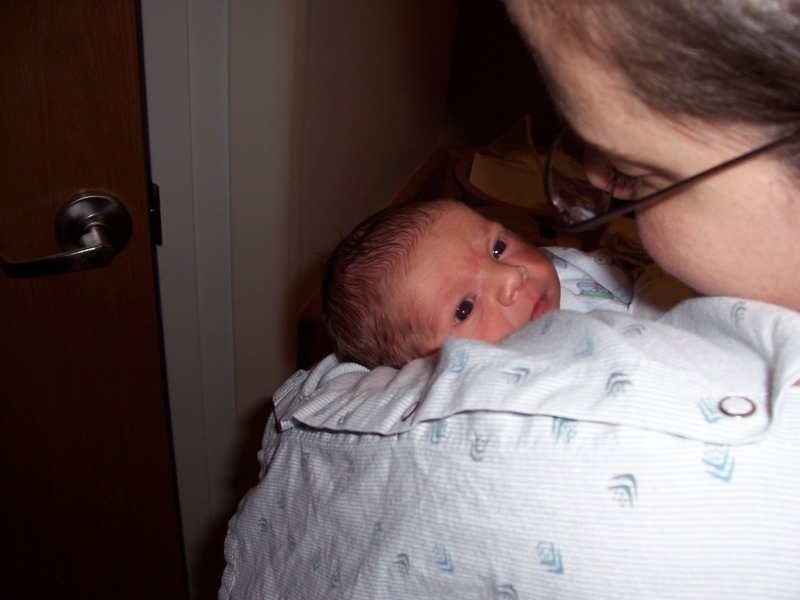 So when they handed my newborn to me, I was a little unprepared. For everything, really. Nursing, care, etc. I spent his first few days fretting about how much he slept – normal for a baby who was nearly three weeks early – and how little he ate. Shouldn’t he want to feed? And then there was the whole learning how to feed him thing. I’ll spare you the details, but suffice it to say, I relied heavily on nurses and lactation consultants in those days after he was born. Recovering from a c-section is tough: there’s not a lot of positions you can sleep or sit in that’s comfortable. So I was having a tough go of it finding a position where I could nurse my new son comfortably. And then, one of the night nurses showed me a position where I was able to lay down on my side, a pillow under my leg, with my son laying next to me. It was perfect: not only could I feed him easily from this position, but if I was tired, I could sleep AND feed without too much worry. It was maybe the third night in the hospital (we got 5 when all was said and done, since he was born in the evening) when Owen woke up for a bit. Since he was awake, I thought, Woo hoo! Let’s do this feeding thing! and I set us both up: me on my side, pillow under my outstretched leg, him on his side, facing me. He wasn’t interested in eating though – he just stared up at me, like he had known me forever. It was a moment I’ll never forget; his dark eyes looking straight at me as I talked to him. And in the weeks to come, when I was overwhelmed with sleep deprivation and his fussiness and sleep issues and feeding schedule, when I felt like a fraud and a fake as a mother, that moment – the one where he knew me – was the one that grounded me. It was the start of our bond, you see. The past two days have been rough ones; I have more work to do than I have time for. I am in heavy mileage for marathon training, and I am sneaking runs in. I am stressed out and tired, and stealing time for work and running. I worked late on Monday night and then again last night, stealing time at 8pm for a run along the Charles. And I missed bedtime both nights. Tonight, though, I was home for his bedtime. We always lay down next to Owen on his bed when we read stories. And we’ll generally lay with him for a few minutes once we turn out the light. Usually he’s talking; asking questions and talking about his day and coming up with stories. I can’t tell you how many times a night I have to tell him that it’s time for sleeping, that we can talk more in the morning, that it’s time to rest and close his eyes. Tonight, though, he was tired from a long day of kindergarten, his after school program, and then swim lessons tonight. So when I turned off the light, I came back to the bed and lay down on my side, my head propped on his pillow, facing him. He rolled towards me, cradling Bear, and tucked his hands and head into my neck. I wrapped my arms around him and he closed his eyes; he was asleep within minutes. I had a sudden memory of that night in the hospital; his dark eyes staring up at me, the weight of him so very slight in my arms. He announced that he learned a new song today, at school. Putting his hands behind his back, he sang, Trick or Treat! Smell my feet! Give me something good to eat! If you don’t, I don’t care, I’ll pull down your underwear! He won’t let me help buckle him into his booster seat anymore – OR unbuckle himself. He does it himself now. Since starting kindergarten, when he wakes up in the morning, he gets himself dressed before he comes downstairs. He gets on the bus confidently, saying good morning! to his bus driver, then sits and waves at me through the window. At swim class, he jumps in without hesitation. He swims underwater as much as he can; showing off for me, for his teachers. He rides his bike as fast as he can, puts his own helmet on himself, and warns me as he’s riding to Stay on the sidewalk, Mommy! It’s not safe to walk in the road! He has learned the pledge of allegiance for school and practices it as much as possible. I remember the day he was born as if it were, in fact, yesterday. I remember what I was wearing; the feel of the spring air, still cold, but warming in the sun. I remember the full moon that rose outside our hospital window. How light he was in the carseat when we were finally on our way home; how it felt like there was nothing in there. The incredulity I felt that we were actually leaving the hospital with a real, live baby – OUR baby. Our son. I love the age where he is at now; love his curiosity and sports-mindedness and imagination. I can’t WAIT for him to learn how to read and write and do math. I very much look forward to watching him grow and change; I look forward to watching him turn into the man he will be someday. It’s just that I can’t wrap my brain around the flow of time. 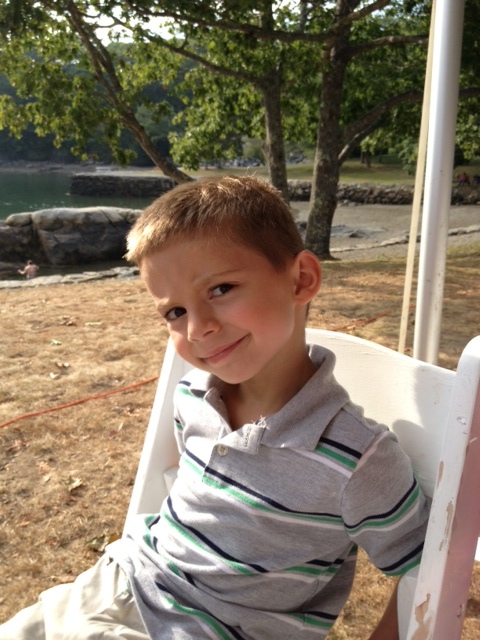 I blinked, and the slight weight of my infant in my arms turned into this boy, this kindergartener. And I’m going to blink again and it’s going to be this teenager, then Jeff and I will be dancing at his wedding. So, yeah. Tonight I’m feeling nostalgic. For the teeny baby of mine. Who is no longer a baby.